Now, before we delve into prepping for this, please know that there is every chance this is a tempest in a teapot. It’s most likely that anywhere from 20 to 200 people will show up with their signs, chant mean things about the President, maybe throw a rock through a window, and go home. If you aren’t near these locations, you probably won’t even know it’s going on unless you check the news. So, while you should be prepared for anything (as usual), you shouldn’t be afraid. 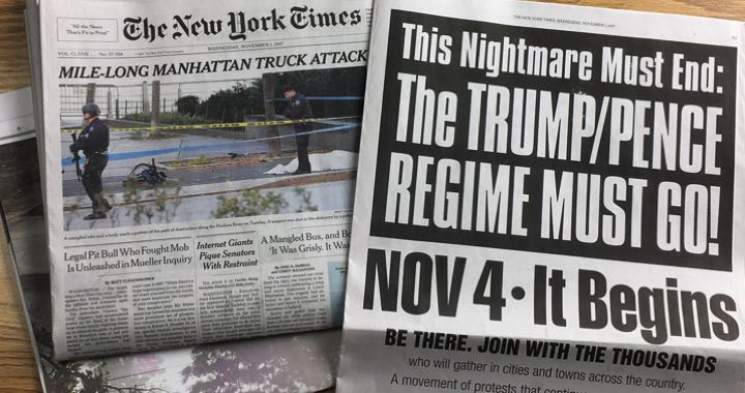 But…considering the fact that this is on every media outlet everywhere (the NY Times actually promoted it with a full-page ad on November 1), the possibilities of all hell breaking loose should at least be considered. I’ve cited before Newton’s Third Law of Physics which states “For every action, there is an equal and opposite reaction.” From Antifa, the threats of violence are becoming more extreme.And if this gets crazy, there WILL be a reaction. 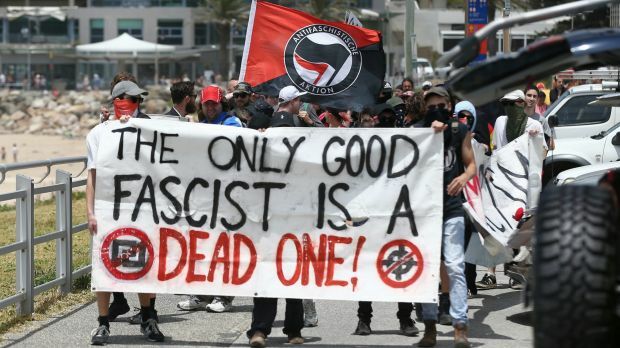 A lot of folks are sick and tired of being pushed around, threatened, and censored by these ironically named Anti-Fascists. You need only check out the comments section on any article about the potential event to know that some fed-up Americans intend to push back and counter-protest. Hard. I have talked to more than one member of the military who says, “Bring it on.” Tensions have the potential to boil over. If your goal is to be out there in the thick of things because you believe it is your obligation to do so, this article probably isn’t for you and I offer you my very best wishes for your safety. If you are planning to avoid any conflict and focus on keeping your family away from trouble, you can be prepared for the possibility that Civil Unrest erupts. By planning ahead, we can avoid the fear, panic, and confusion that leads people to rush to the store and clear the shelves like a horde of hungry locusts. We can stay away from the angry masses, the rioters who will use any excuse to steal, and the hungry people who are determined to feed their kids no matter who stands in their way. Whether the next few days lead to pandemonium or even martial law to crack down on unrest, a prepared mindset, a defense plan, and a well-stocked home can help to keep you and your family out of harm’s way. My personal goal is the safety and security of my family. This is my primary responsibility. Spend today getting ready, just in case. Here are the most vital things that you can do to be prepared for civil unrest. Once you make your way home or to your bug-out location … STAY THERE. Sometimes despite our best intentions, the fight comes to us. Even though we stay home, something about our place draws the attention of an unsavory person or group. Defense is two-fold. Your best defense is avoiding the fight altogether. You want to stay under the radar and not draw attention to yourself. The extent to which you strive to do this should be based on the severity of the unrest in your area. Some of the following recommendations are not necessary for an everyday grid-down scenario but could save your life in a more extreme civil unrest scenario. Don’t be drawn outside. Sometimes, thugs will try to engage people by damaging their car or property outside. Going outside, you will likely be outnumbered. In most cases, you’ll be better off just calling the insurance company the next day. Have a plan to deal with a fire. Fire is often used in situations like this. Be sure to have well-maintained fire extinguishers in case of a small blaze. What about a martial law event? While many of the officers involved most likely just want to resolve the situation and go home to their families, the methods that are often used are not methods most of us wish to encounter. Avoid crowds. If you are in the midst of a crowd, you’ll be considered part of the crowd and treated exactly like everyone else in that group. If they get tear-gassed, so will you. It’s guilt by association. If the crowd is violent, and you are part of the crowd, you will also be considered violent, and you’ll be dealt with accordingly. Legally, you are actually guilty if you are part of a group that is violent. Underneath the uniform, cops are human. I’m not justifying the brutality, the methods they sometimes use, or the assaults on journalists. Cops are just as likely to be swept up in a herd mentality as protesters and rioters are during a high-stress situation. By understanding this, you can be better prepared. Every civil unrest scenario is different. You must make a personal plan based on your environment, your neighbors, and the type of situation that is occurring in your area. By thinking ahead, you’ve already improved your family’s chances of surviving unscathed. The post What to Do If All Hell Breaks Loose appeared first on LewRockwell.